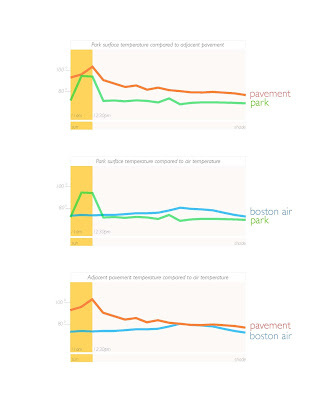 One hundred and twenty-six square feet is the size of one metered parking space in Back Bay, Boston. 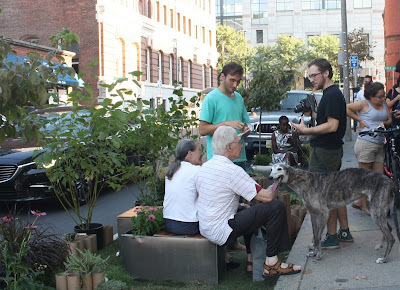 But by sunrise, Friday September 18th, 2015, one corner of Newbury and Hereford Streets was transformed into a public park. 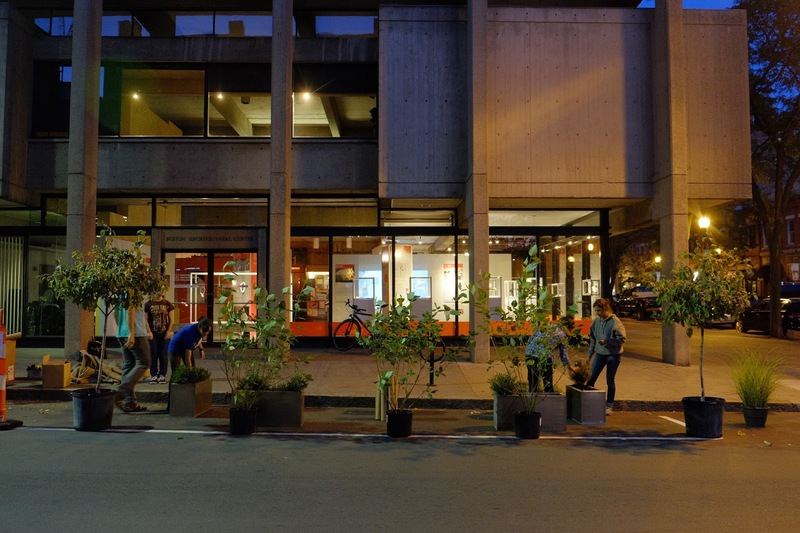 Potted trees and shrubs screened vehicular circulation from a rectangular oasis. Featuring a variety of seating options, the pocket-sized park hosted over one hundred visitors in twelve hours. PARK(ing) Day is an annual, international event where metered parking spaces are transformed into temporary public parks. 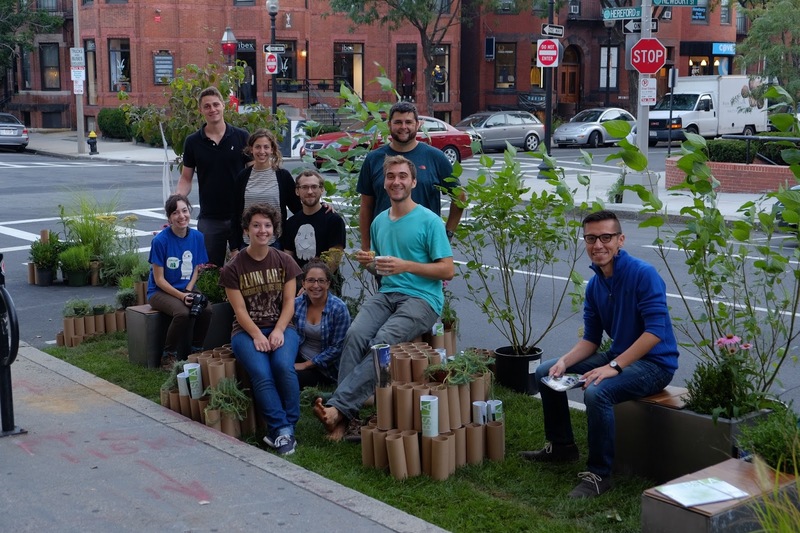 This year, a group of students from the Boston Architectural College’s student chapter of the American Society of Landscape Architects (SASLA), designed and built a park just outside of their school for the day. The core planning team with early morning volunteers. The process began last spring when Mark Focht, Past-President of the American Society of Landscape Architects, spoke to the landscape architecture students about his experience as First Deputy Commissioner of Philadelphia Parks & Recreation. 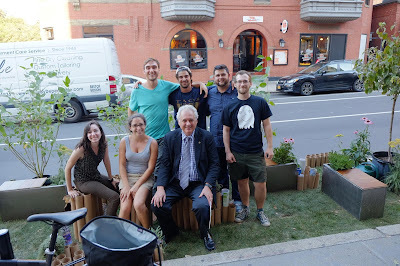 With Mark’s encouragement, the idea of SASLA’s participation in PARK(ing) Day came into fruition. Gathering a core team of motivated BAC students, SASLA organized a summer charrette to design and plan the event. The process then evolved from prototypes, to collecting materials, to the construction and assembly of a full-scale mock-up in a student’s driveway. 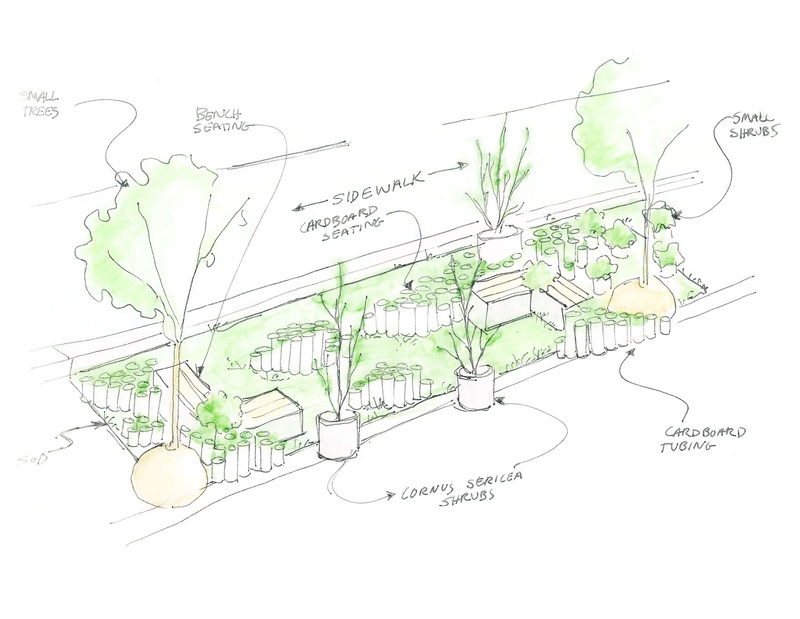 To anchor the park, we converted four second-hand planters to benches using reclaimed flooring. 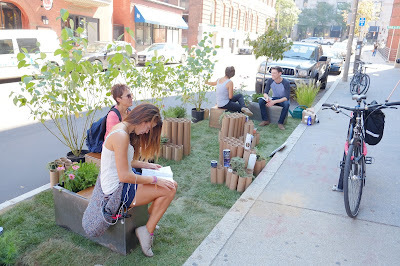 Within the benches, we assembled interactive seats using cardboard tubes found at Extras for Creative ReUse, a second-hand craft center in Lynn, Massachusetts. Red Twig Dogwood shrubs (Cornus sericea) screen automobile traffic on Hereford Street. On the day of, we borrowed two pickup trucks and loaded them with the plants and materials. The potted plants were borrowed from a local landscape designer, Robin Dey of Robin Evans Landscapes. Sue Angelli, of AGD Landscape Design donated sod left over from a landscaping project. We were also fortunate to have Permaloc Corporation offer to be a generous sponsor – providing funds for materials and being a big help with making sure the volunteers were well fed. We were able to reuse and recycle all of the acquired materials, creating very little waste in the end. Among the first visitors was a pair of honeybees that arrived just shortly after set-up. We watched in awe as they began pollinating the native North American coneflowers (Echinacea purpurea). With this ecological system at work, we felt at ease in the space we had just created. Two women hurrying to start their day asked, “How long will this be here?” Several passersby smiled and one said “Hi, I’m Joe. What is this about?” A cyclist stopped to take a photograph of the unusual while another shouted, “Love it! 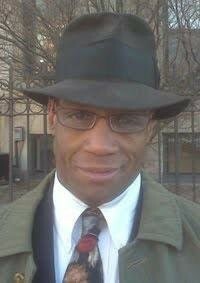 Reminds me of San Francisco.” By 9am, traffic faded in the background. We took off our shoes to feel blades of grass beneath our feet and we settled into the peaceful pocket park. Despite urban conditions, a honey bee pollinates the Purple coneflowers (Echinacea pururea) within the park. Full sun filled the park at 10:30am, but it did not last long. 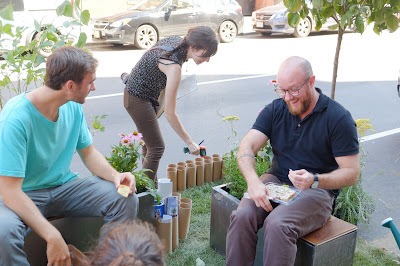 Jess Alpert takes spot temperature readings as Aidan Ackerman and Jonathan Cave enjoy their lunches in the shade. 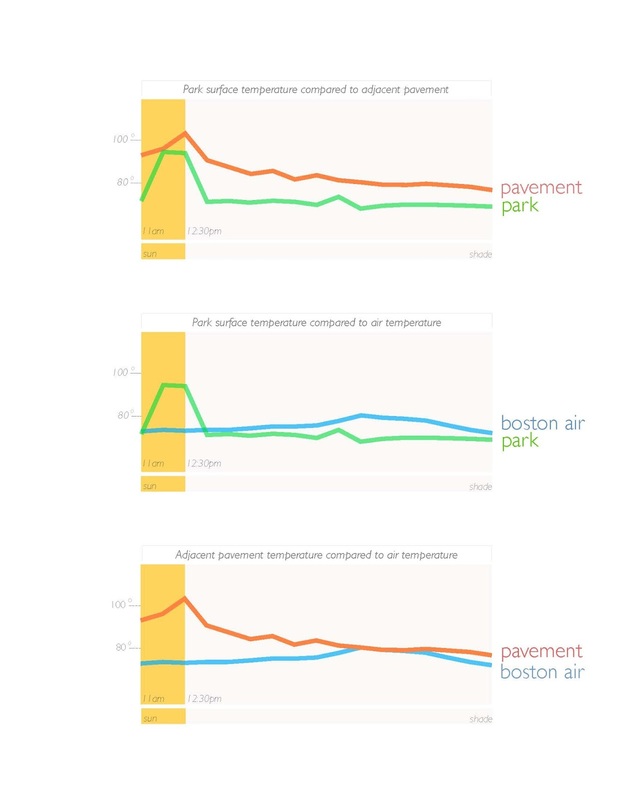 Graphs compare spot temperature readings from the data collected on September 18th. A BAC student reads the BSLA field-guide while others discuss the effectiveness of the shrubs to screen traffic. Musicians from the Berkley School of Music, 2Birds Band, were walking by and we asked them to play next to the park. As the instruments came out, the park transformed into a music venue, drawing more and more to stand by when the park was full. 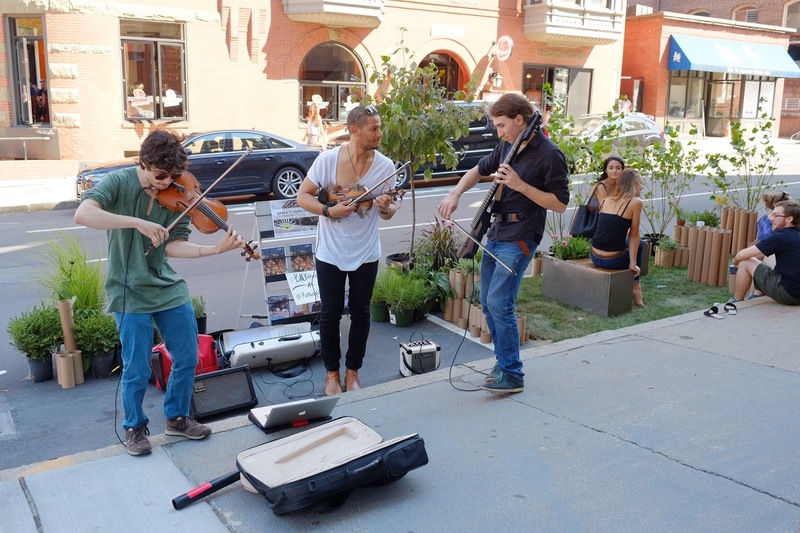 Berkley students of 2Birds Band play an eclectic mix alongside the park. The BAC’s new president, Glen LeRoy, joins the SASLA team for a photo. 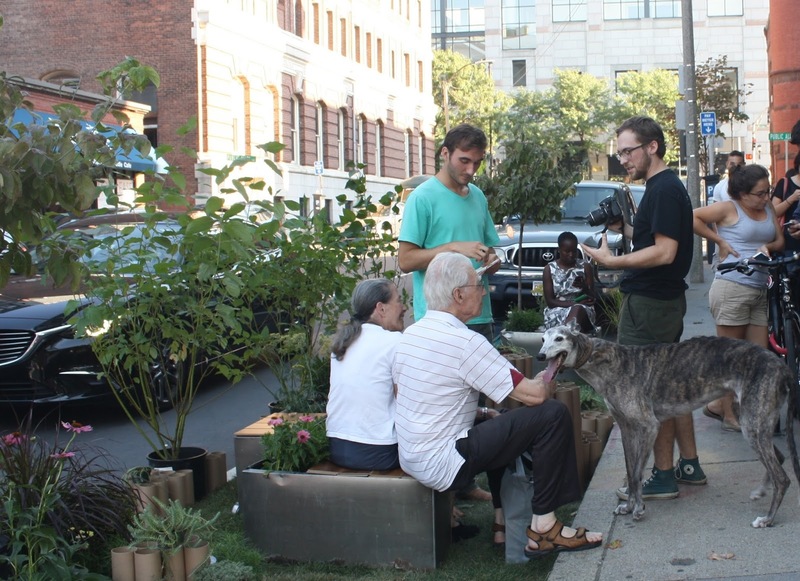 BAC students chat with local residents and their Greyhound companion sharing a bench. At the end of the day there was a vibrant crowd enjoying the park. The BAC community joined with neighbors and residents. The unique public space made many feel welcome. The future of streets designed for people was the topic of many conversations. Rania, a BAC student exclaimed, “I think this park should be here forever”, and we completely agree. True to the BAC spirit, we are already planning the next park, but this time we hope you will join us! For interested participants, please contact us at SASLA@the-bac.edu. 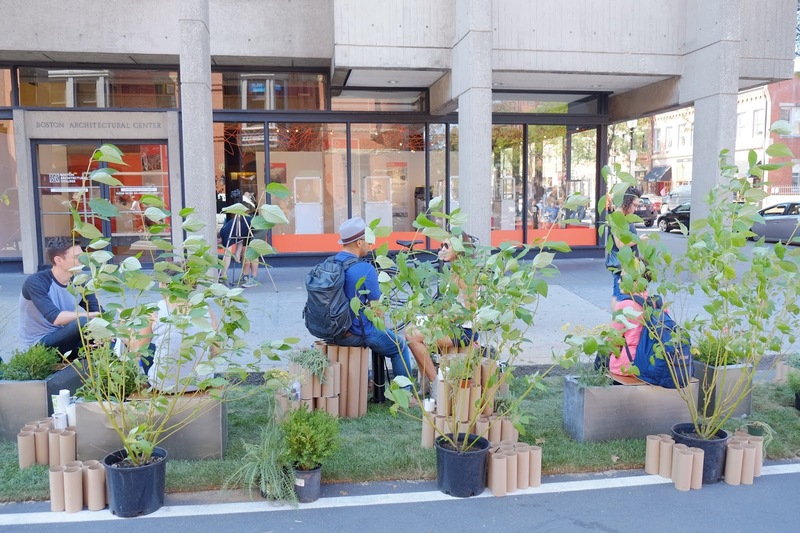 SASLA’s Park(ing) Day 2015 would not have been possible without the unbelievable effort between the BAC students and the Boston community. Our sincerest thank you to the following individuals: Daniel Martin of Permaloc Corporation, Robin Dey of Robin Evans Landscapes, Sue Angelli of AGD Landscape Design, Extras for Creative ReUse, Mark Focht, moms, dads, siblings and friends. Thank you for lending us a truck, a driveway, helping hands and loving support! BAC students assemble the park in the designed configuration for the day.